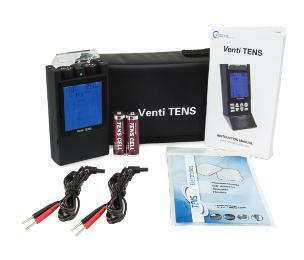 The Venti TENS Digital Pain Relief System is a dual-channel digital TENS device equipped with three waveforms and twenty modes of operation to choose from - twelve presets and eight manual. The Venti TENS Digital Pain Relief System is a dual-channel digital TENS device equipped with three waveforms and twenty modes of operation to choose from - twelve presets and eight manual. This incredibly advanced, pocket-size portable device is known for its body-part specific settings, which provide ease of application and set-up by patients. Both, its pulse width and pulse frequency are also adjustable. Used for symptomatic relief and management of chronic pain and acute post-surgical or post-trauma pain.